Last night on a hunch I said to my wife, “Lets go fishing tomorrow.” I still wanted for my wife to catch her first fish and today seemed to be a very good day. The lake was calm and the weather mild. So at around 9:00 am we loaded up the boat and drove to Nicola Lake. The lake was devoid of other fishers and we saw a lot fish jumping, a promising sign. While I paddled the boat toward the middle of the lake, where it is deeper and the bigger fish hang out, Heidi trolled a wedding band lure. Once on the spot we wanted to be, I began trolling with a small silver spoon. Ten minutes into fishing and we both still had no action. It was time to change lures and try something different. I changed Heidi’s lure to a Rapala Fat Rap and mine to a Rapala Original Floater. After the second cast I had a bite but since I was paddling the boat I was to late to set the hook. After another cast the line had not been two minutes in the water and I got another hit. This time I was ready for it. 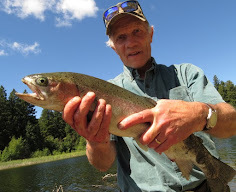 The 14” rainbow jumped high and fought hard but to no avail; it was a keeper. Not long after the first bite Heidi announced excitedly that something was tugging on her line too. “Yank on the rod to set the hook,” I shouted equally exited. 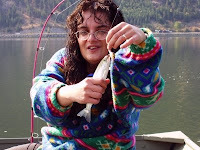 That is what I wanted for Heidi- to catch her first fish. I wanted this more than anything else. It even kept occupying my mind when I went hunting. Now it finally happened, my wife finally had her first fish on the line. What more could possibly happen to make me happier at this moment? Nothing! At the end of Heidi’s line a small but feisty rainbow trout was quickly landed in the boat. Unfortunately, it was too small to keep, a few pictures of the memorable moment and the fish was released to live another day. Still Heidi got hooked on fishing and I think I found myself a new fishing partner. On the way back to shore Heidi had another bite and judging by how high the fish jumped out of the water it was bigger than the one I got, a lot bigger actually. Heidi’s line got tangled up with my line and the fish came loose before it could be landed in the boat. Still it was a fish on the line. After that it was time to head to the boat ramp; all that fishing made us hungry and in the hurry to get to the lake this morning we forgot to pack a lunch. At the boat ramp I met a duck hunter coming to the ramp from the other end of the lake where it is overgrown with cattails, reeds and water grass. It’s the perfect waterfowl habitat. He had a limit of ducks in his boat and after a brief chat and exchanging congratulations for a good days hunting and fishing success he gave me a few tips on where on the lake to hunt ducks and geese. 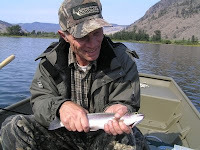 I have been looking for a place to hunt waterfowl around Merritt (I have seen plenty of ducks on the Nicola Lake but did not realize it is legal at that location to hunt them) and would I have gone deer hunting as I first planned to do I still would be looking for a waterfowl place. Sometimes it pays big dividends in more than one way to go fishing on a hunch. Today it paid triple. My wife caught her first fish ever. I caught one for dinner tonight and I got a place to hunt waterfowl next week. Picture of Othmar Vohringer courtesy of Heidi Koehler of Artemis Graphics and Design. First of all, congratulation to you and Heidi on your successful fishing trip. You both sound like you had some fun and that is what fishing is all about. Keep those Rapala's on Heidi's line and she will enjoy fishing for years to come. Go Heidi!! As you know, I love fishing with them too! Thanks also for the link to my blog. Maybe we can share some readership. Thank you Mel, I passed your congratulation on to Heidi and she is happy to receive it from a veteran fisherman like you. Yes we have had a very productive day in so many ways. To my mind there is nothing like sharing our outdoor heritage with a family member, good friend or your own wife. 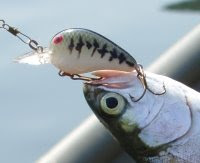 From previous discussions between you and me you know how fond I am of Rapala lures. These lures are for many years my secret weapon in the tackle box and when all else fails a Rapala comes into action and in 90% of the time saves the day. I am so convinced about the Rapala that I have decided to head out tomorrow to get Heidi her very own assortment of these lures. It’s a must for every serious fisherman/women. You’re very welcome about the link. I truly believe that your new blog will become a great information source for every serious sport fisher, just like your old was. Keep it up my friend. YAY for Heidi's first fish. That's awesome. Here's hoping it's the first of many. Fishing is so much fun. I'm glad she's been able to experience that. Thank you Kristine. I will pass it on to Heidi. We did had a fun filled day and we needed it too. Bass Pro-Shop is my go-to source for all my fishing needs. © Copyright by Othmar Vohringer. All rights reserved. All content on this blog is the © Copyright of Othmar Vohringer. Awesome Inc. theme. Powered by Blogger.